There it is. It didn’t start off looking like that! For the last four to six weeks, I’ve closely watched the construction of a water tower in a neighborhood I drive through every morning. I watched the men erect the concrete cylinder, seal it and work on the tank that would become the top of the tower. However, the freshly painted tank didn’t start out on top of the construction. It started at the base. The white tank used to surround the base of the concrete tower, and for weeks, I wondered what the workers were doing with it. I watched the tank start off as several metal pieces that they sealed together. The sealing took several days. There were several gaps in it, and they filled each space. Then they proceeded to paint it. They put about two or three coats of white paint on it. This also took several days and all while the tank was still at the base of the concrete construction. 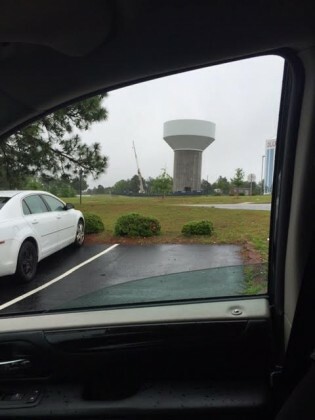 However, today as I drove by, I saw that they have now moved the white tank to the very top of the tower. Now, it looks like something I can recognize. The Lord uses everything to speak to us, and He used the construction of this water tower to speak to me. First, the Lord showed me how the tower started out unrecognizable to me. My untrained eye could not see the finished project. I didn’t know why a huge metal tank surrounded the base of the concrete tower for weeks. Secondly, before they moved the tank to the top, the construction workers had to prepare it. They had to seal it, paint it and whatever else they did to it to prepare it for erection. They also erected a thick metal beam at the top of the concrete cylinder yesterday that would hold the tank and keep it sturdy and in its place. They had to do all of this before they could lift up the tank, which as I said before, stayed at the base of the cylinder for weeks while they prepared it. Now, the construction project is starting to look like it is supposed to – a water tank. The Lord told me that there are areas of our lives that don’t look like they make any sense. We don’t understand what the Lord is doing because everything looks confusing and looks like it’s in disarray to our natural eyes. We are wondering why God hasn’t lifted up our ministry or our business or our project because it’s still hovering around at the base of everything else that’s going on. However, God says, I’m working on something in your life, and I’m preparing it. It doesn’t look like anything to you and you don’t know how I’m going to elevate it, but trust me because when it’s finished, it’s going to blow your mind. God says, I couldn’t lift you, your work, your ministry or your project up yet because it wasn’t ready. It wasn’t the appointed time, but trust me. I’m constructing something in your life and it’s going to be awesome. I wish I would have taken pictures of the water tank project during each phase. However, I hope you understand that God is working on your situation and He is going to elevate you in due time. Keep holding on and keep pushing forward to the manifestation of God’s promises.